Two muscles in the back of the leg pull upward on the Achilles tendon, as shown in Figure 4.40. (These muscles are called the medial and lateral heads of the gastrocnemius muscle.) Find the magnitude and direction of the total force on the Achilles tendon. What type of movement could be caused by this force? Figure 4.40 Two muscles pull upward on the Achilles tendon. This force would raise the heel. This is College Physics Answers with Shaun Dychko. We can see these two forces being exerted on the Achilles tendon and they are of equal magnitude, both being 200 Newtons, and they're at equal angles, 20 degrees and so this means the x component of each will be the same but in opposite directions and they'll cancel out. So we define the net force here or the total force exerted by the muscles on the tendon, we need to only think about the y components. So the total force in the y direction is going to be the force one in the y direction plus the force two in the y direction but since they're equal magnitude and equal angles with respect to the vertical, we can just say two times the y component of one of them. So that's going to be F one times cos 20 and it's the cosine because we're looking for the adjacent leg of this triangle and so this portion here vertically is F one times cosine of 20. 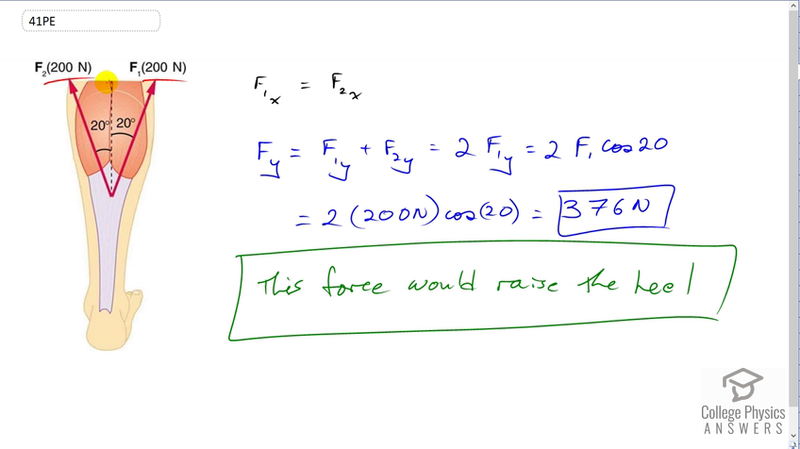 So we have two times 200 times cosine of twenty gives us 376 Newtons total and that force would raise the heel because it is lifting up on the heel here.